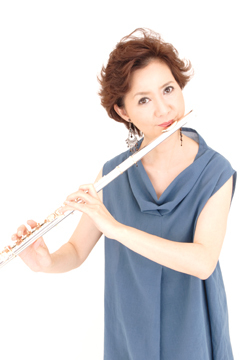 RIE AKAGI By making the full use of her excellently trained classic background, Rie Akagi is the only female flutist in Japan who can perform salsa/latin jazz and soul jazz with a startling agressiveness. Known to be the leading “Caribbean Flutist”, she has gained great reputation from not only the Caribbean Seas but from around the world as one of the promising contemporary performers , “ripe” and “blooming”. The “Big Guys” of the salsa world such as Tito Puente, Larry Hallow, Willie Colon or Michel Camilo, Dave Valentin from the jazz scene have all recognized the energetic performance and great technic of Rie Akagi. She has performed at famous jazz festivals such as the “ Concord Jazz Festival” in San Fransisco, “Jazz Plaza” in Cuba, “Noche Y Galeria” in Puerto Rico and received a full standing ovation from the excited audience everywhere she went. She is known for her “Magic Flute” around the Caribbean Seas, and there is no doubt that she is one of the best performing female flutists with brilliant technic and agressiveness recognized from the world. One opportunity which made her name known outside Japan was the six monthes stay in Puerto Rico as a Culture Exchange member dispatched from the Japanese Goverment. Even though the stay was short she actively performed in various occasions such as the Japan/Puerto Rico Friendship Concert held at the National Museum of Arts(co-sponsored by the Japanese Consulate in New York) or performing together with Luis “Perico” Ortiz, Gilberto Santa Rosa, Cacheto Mardonado and Batacumbele,Pedro Guzman and many other top artists’ concerts or recordings, thus making her name and talent well known throughout the Caribbean Seas. In 1985 she made her fisrt album debut. She has recorded up to now 13 albums, including the “Caribbean Flutes(Flauta Caribena)”, her next coming album scheduled to be on sale this May 2007 from JVC, which she plays with Grammy Awards winner Michel Camilo. Among the albums, “Isla Verde” “The Promised Land(Isla del Encanto)” and “Moon Island(Perla del Caribe)” which were recorded and also sold in Puerto Rico, grabbed the hearts of the Caribbeans. Especially “Isla Verde” which Rie Akagi herself went to Puerto Rico for promotion was welcomed enthusiastically by the people and the media. Furthermore, in 2003 she made her first The U.S ~The Caribbean Seas tour with great success. Since then she has been performing periodically in and around Puerto Rico. In 2005, she was invited to Inter American University of Puerto Rico as a Professora Invitada to give a lecture on “Japanese Culture”. She has also been invited as Professor for the “ Concervatorio of Music of Puerto Rico ” , founded by the late Pablo Cazals. Considering all the important duties she has worked upon with great effort, the UNESCO office in Puerto Rico awarded her for “contributing deeply to cultural exchange among different regions”. Her vital role between Japan and Puerto Rico has been highly evaluated and appreciated. Her approach towards music is borderless. Take a look at her works in Japan. Rie Akagi has formed a latin/soul jazz unit in 2006, and has also been experimenting with different units adding musical essence from India and Spanish flamenco. Not to mention performances in contemporary music and classical music, she shows her talents by writing and arranging songs . She has written CD included flute score books such as “Flute Pieces by Rie Akagi” (Ongaku-no-tomo-sha) , “Let’s Play the Flute”(Ongaku-no-tomo-sha), and “Easy Ways to Play the Flute”(Seibido).